So busy outside enjoying the summer, I haven’t spent much time in the kitchen! I was inspired by the delicious fresh cherry tomatoes from the farmers market to try this new recipe. We ate this warm, but I am sure it would be great as a cold salad too. Sauté onion and garlic in oil in frying pan over med-low heat until soft. Add spinach and olives, and turn with tongs until spinach is just wilted, about 1 minute. 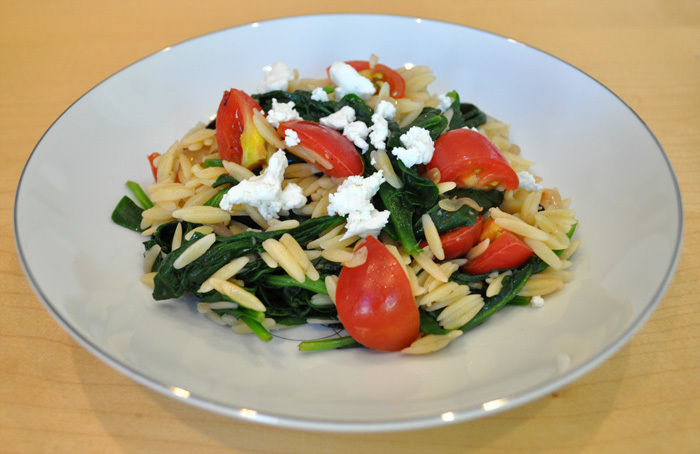 Add cooked orzo, tomatoes, and lemon juice to spinach mixture. Toss and season with salt and pepper to taste. Serve with a sprinkle of cheese on top.